The weekly Wednesday night Blues Jam we know and love was established on the 21st May 2003 at The Heathcote Arms in Leytonstone, by the late Ray Bartrip - a highly respected Hammond-Player and one of the most popular musicians on the Essex Blues scene. Aware of my previous experience of running blues jams at various venues, Ray approached me and my wife Vera to help him and his partner Sue in running the new venture. He also asked me to act as Bass player for the House Band, with his fellow Bad Town Blues band member Reg Patten on Drums and our mutual friend Pete Bull on Saxophone. In keeping with the practice at our previous jams, we dispensed with a regular front-man in favour of weekly guest artists: a feature that proved very successful and has continued ever since. From day one, the Blues Jam was a hit, attracting jammers, listeners and guest artists from all over the South East/Essex blues scene and beyond. And I do mean beyond: over the years, the roster of contributors has included players from the USA, Canada, Germany, Italy, France, Russia, Lithuania, Ireland, the Netherlands, Japan ...AND Hackney! Ours is first and foremost a Blues Jam for jammers - not just a vehicle for the House Band. As regulars will know, each event opens with a short set from that week's guest artist, backed by the houseband. However, the main part of the evening belongs to our jammers, who are called up onstage in random groupings put together by Vera. At the end of the night we invite our guest back on to perform a few final numbers. Sometimes this is with the houseband again, but quite often the guest will opt to share the stage with our jammers for that last set. We are proud to be known as one of the friendliest blues jams in the country. Over the years we've acquired a well-deserved reputation for quality music-making, but just as important to us is the village-like sense of community that exists among our jammers & listeners. We like to think that our blues jam is a place where newcomers very quickly find themselves among friends. In June 2005, owing to the demands of his increasingly busy schedule, Ray decided to bow out and hand over the reins to Vera and me. Sadly, my first week as "boss" involved officiating at a very solemn occasion: a tribute night for one of our regular jammers, Andy Tett, who had passed away the previous week while on stage at another blues jam run by Richard Dobney and myself at the Loaded Dog in Leytonstone. Through the kind-hearted generosity of both players and audience, that night we managed to raise a considerable sum of money to benefit two of Andy's favourite charities. Andy remains in our thoughts to this day. Pretty soon it became clear that organising the jams, playing in the houseband, taking photographs and updating the website every week was one ball too many for this juggler. I was knackered! I had no hesitation, therefore, in approaching one of our most enthusiastic and talented regulars - the accomplished guitarist and vocalist Stevie King - to join the houseband and help organise things. Stevie's blues knowledge, performing experience and easy microphone manner also made him the ideal person to act as Master of Ceremonies. Completing the onstage line-up, Hammond maestro Claudio Corona was the obvious choice to take Ray's place on keyboards - a role he filled with consummate skill for several years, until one night we glanced away for a moment and found he'd been head-hunted to join the Paul Garner Band. ...D'oh ! The Heathcote Blues Jam continued to go from strength to strength, establishing itself firmly within the blues-loving community, but our progress wasn't without its share of sad occasions. The passing of two of our much-loved jammers - Craig Fornier and "Good Time" Eddie Bailey - were particularly difficult times. Both will always be remembered with great affection. In mid-2006 attendances mysteriously began to diminish, to the point where we simply couldn't afford to support the number of players in the house band. It was with great reluctance, therefore, that I had to ask Saxophonist Pete Bull to step down temporarily until our door-takings picked up. Within a matter of weeks our fortunes improved again, but regrettably Pete decided not to return. Over the following months, attendances continued to rise. For the Heathcote Blues Jam, the future looked rosy. Little did we know what was round the corner.. The summer of 2008 brought dark clouds to our horizon - well... ONE dark cloud, to be precise - in the shape of a new Heathcote manager appointed by the brewery. Initially he appeared to be very enthusiastic, mouthing promises of improved advertising and expressing a firm desire to keep the Blues Jam thriving. His enthusiasm was short-lived. After only a couple of weeks, he told us he'd decided to withdraw our funding. This was a terrible blow. The Blues Jam is not a profit-making venture. Without a small weekly financial input from the host venue, we simply can't operate. We told him we'd have no choice but to relocate. With only hours to go to the next scheduled jam, he agreed to a 'stay of execution', but it was too late: the writing was on the wall. Thanks to his negative attitude, what had been for 5 years a friendly and positive relationship was now broken beyond repair, and with every week that passed, things got worse. Matters came to a head in the November. Despite a steady upturn in attendances, the manager once again decided to withdraw our funding, and this time he said it was final. On the 17th December ( ironically, the date of our annual Christmas Party ) we played our last night at the Heathcote Arms. ...and what an amazing night that was! The place was packed so tight you could barely move, and long-time regular Jimmy Dublin signed us off with a storming version of "Whole Lotta Love" that nearly brought the ceiling plaster down on Mr. Manager's miserable head !! Immediately the search began to find a new venue: somewhere where we'd feel welcome; where we'd be sure to receive proper support and the necessary sense of security to enable us to continue the very warm and friendly relationship we had developed amongst our jammers & listeners over the years. It took a while - several potential venues were investigated and found wanting - and all the while, Blues Jam stalwart Steve Cook kept mentioning this great local pub he knew of, with a good function room and an even better attitude to live music. Now, what was it called...? 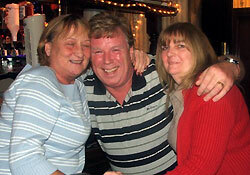 Thus it was that we had the good fortune to meet Gerry and Maureen, licensees of The Coach and Horses. Their response to our proposal was so overwhelmingly positive and welcoming that Stevie, Vera and I knew immediately that we'd found the right venue. We settled in very quickly at our new home - and what a home-from-home it was! The cheerful, supportive atmosphere at the Coach and Horses was tangible to all who visited. Thanks to Gerry, Maureen and their hard working bar-staff, we were once again able to look forward and plan ahead with confidence. In the spring of 2011, Gerry and Maureen decided it was time to retire and move back to their native Ireland. In May 2013 we marked our 10th Anniversary with a special celebratory jam, and at a time when so many live music events are feeling the pinch of the recession, we appeared to be going from strength to strength, with new jammers and audience members coming to join the fun with every week that passed. Alas, the C+H's new licencees didn't seem able to appreciate this, and over the next 5 years, in a thousand small ways they did their best to make us feel ever more unwelcome. They also decided to re-decorate the room we used - a process which included ripping out all of the carpet (which ruined the room's acoustics) and making a mess of the electrical wiring, so we could no longer use any stage lighting. Finally, in February 2018 they evicted us, giving us only 2 days' notice. Once again we were homeless! Four months later and WE'RE BACK, with a new venue - Leytonstone Ex-Servicemens Club - that's already well known for its positive live music policy, and a new regular weekly slot - Monday nights between 8:30 and 11pm. It's been quite a journey, hasn't it? - one made all the more enjoyable by having great travelling companions. Chief among these has got to be those listeners who cheerfully give up their time to assist in setting up and running the jam, week in, week out. 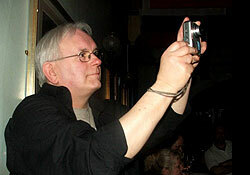 There's the ever-present and ever-welcome Keith Geddes, who spends most of every night glued to the viewfinder of his camera. I've lost count of how many of Keith's shots have featured on the pages of this website over the years. Then there's Stevie King's girlfriend Beckie: - a real ray of sunshine, always there to lend a hand when she's not busy at the video camera. ...Or texting! 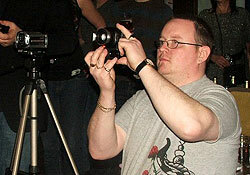 Another deft lens-wielder is Wayne Mills. 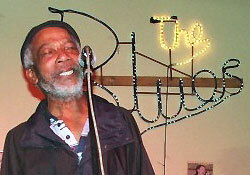 Wayne first joined us in June 2008 and very quickly earned his credentials as an invaluable member of the Blues Jam "road crew". As regulars will know, at the end of a jam I do have a tendency to get caught up in conversation. Mea culpa! If it weren't for Wayne's calm efficiency in dismantling and packing away the gear while I gab, I swear we'd still be tidying up into the small hours. Thank you, Wayne - and thank you to all those volunteers who help us to pack up on the nights when he's unable to be with us! Finally, I must extend our sincerest thanks to Ken Cumberlidge for his tireless work and expertise in constructing the very pages you're looking at. When Ken appeared in May 2008 we were pleased to be adding another bass player to our roster. We little suspected that we'd end up with a new website into the bargain. ...and oh yes - he'd like you to know that he fixes valve amps, too. The unflagging hard work and enthusiasm of these volunteers epitomises the spirit that has kept the Blues Jam alive and kicking all these years, and will, I am sure, continue to do so for many more to come. Our aim is to build upon what we've already achieved and continue to provide not just a great Blues Jam but a place of friendship and hospitality for all our visitors, both onstage and off.